If you are wondering why the Island’s real estate market has been doing so badly lately, the recently released data on dwellings from the October 2011 census provide a good clue. THE number of new dwellings constructed in Cyprus swelled from 70,094 in the ten-year period of 1991-2000 to 136,906 in 2001-10, marking an increase of 95%. Yet the number of households in the same period grew by only 71,100, or 31%. Newly constructed vacant dwellings grew by 288% in the same period, from 5,246 in 1991-2000 to 20,364 in 2001-2010. Even allowing for the fact that some dwellings were built to be used as holiday homes (these are itemised separately in the figures from vacant dwellings), one has to wonder why so much investment was poured into dud real estate. Annual construction of new dwellings peaked at 19,200 in 2008, but had dropped to 10,098 by 2011. Construction of new dwellings that were vacant also dropped from 3,562 in 2008 to 3,039 in 2010. But they mysteriously rose again in 2011 to 4,722. What does this increase tell us? One thing it tells us is that developers and their creditors must be eternal optimists. The relationship between dwelling permits and dwellings constructed shows that new dwellings normally take around a year to construct. The year 2010 was when Cyprus climbed out of recession and we all thought that the crisis was behind us. So although new dwellings authorised actually dropped in 2010, it looks like developers took the mild upswing as an encouragement to build more, resulting in a higher number of new vacant dwellings in 2011. Unfortunately all this has done is to have left us with a big overhang of housing stock. 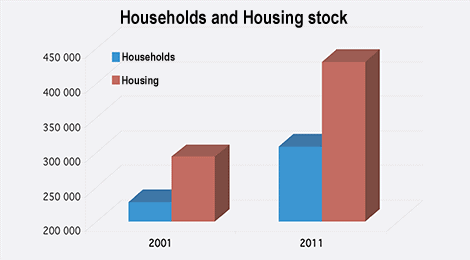 In 2011 we had a total housing stock of 431,059 but only 309,300 households to fill them. Yet ten years earlier, in 2001, we had a total housing stock of 294,143 and total households of 229,000 – just enough spare for the few tourists who decide to buy. With Europe in the doldrums, these dwellings are likely to remain empty, and getting crumblier and uglier by the day, for the foreseeable future. So maybe next time developers and bankers get excited about a real estate upswing, someone should tell them to call an economist. Cyprus is VERY different from Spain, Portugal and Ireland. So different it beggars belief. Andyp points out in the piece on the BHC article that lawyers have delayed registering contracts of sale until the developer has taken out a further advance on already sold property. This can ONLY be achieved if the developer goes to his mate the Bank Manager after the sale has been agreed and shows him the new value of the property i.e. the sale price. The bank then arranges the further advance ON PROPERTY THAT NO LONGER BELONGS TO HIM and gives the developerâ€™s solicitor the nod so he knows when to register the sales contract. If the purchaserâ€™s and the developerâ€™s solicitor are the same person, it helps, but if they are not and the above still happens, then what does it tell us? Hell, Iâ€™ve even heard of the Bank Manager having the temerity to use a draft copy of the VERY SAME contract of sale document to grant a mortgage loan to the purchaser! Howâ€™s that for knowing the property doesnâ€™t belong to the developer any more?!! Then, there are the laws to protect the developer when his company does go bust. These levels of complicity and dodgy dealing, right the way up the food chain, are UNIQUE to Cyprus (and would be chuckle-worthy if it werenâ€™t real people and real money weâ€™re talking about). @John Swift – It’s mainly the increased cost of land that pushed prices up, construction costs have kept pace with wages. Pavlos Loizou MRICS gave a talk to my Rotary Club on the subject in January – take a look at his presentation at Review of the Cyprus Property Market. Around 1998-2003 I could sell my 3 bed semi in the UK, buy a nice detached house/bungalow in Paphos and have a tidy sum left over now it is the other way round and until Cyprus property drops to a sensible level again there will be empty properties a go go in Cyprus. Surely it should be the job of the planning departments to say ‘no more’ when thousands of properties are standing damp and empty? Excellent statistical analysis by Fiona. Very useful to underpin “feelings” in such a detailed way – and shows the full picture of the sheer size of the problem Cyprus/Cypriots have created. None of this is much different to Ireland, Spain and Portugal, though, all of whom are now well into Bail-out territory ( with only Ireland so far making any real ‘recovery’) – they all pursued massive construction and property strategies supported by many banks, weak, overblown lending, and quite a few ‘regulators’, not to mention Governments – where they had little manufacturing or significant ‘other services’ to ensure width of economic activity. Greece, Cyprus’ near neighbour and cultural friend/influencer was different though – not really big in property and construction but profligate in the extreme – being widely recognised as a ‘basket case’ that should never have been encouraged to join the EC. Jim, below, assesses, for me, the current situation very well : Cyprus has -finally! – started to emerge from years of Denial, has continued to support the ‘goose that laid golden eggs’ way beyond any economic logic, and has now run smack-bang into a massive economic & banking crisis which the Troika will currently be forensically analysing and……..well who KNOWS what measures they will demand in exchange for government and bank bail-outs that will surely, once the sheer size and scale of the whole Cyprus situation has been determined, be considerably greater than what has so far been requested? It won’t be long now before we find out, and for sure it will prove to be painful, even factoring in hoped-for oil/gas revenues that may – or may not! – accrue some considerable years into the future. Please note, the main reason why these banks were (and still are?) throwing money at these developers hand over fist, regardless of the realities. Is due to the lucrative commissions paid to the Bank officials involved in these transactions. R.B. Excellent article (apart from the fact that most “official” figures in Cyprus enjoy a thorough massage before emerging into the light of day) and one which asks the question that a small consortium of friends and I asked a couple of years ago: why continue to construct buildings for which the likelihood of selling is decreasing all the time (unless, of course, you’re just thick)? With the big-headed and grandiose intention of â€œsavingâ€ the Cyprus property market (I know, I know, aim big, fail even more spectacularly! ), we looked at every aspect of the damn thing in GREAT detail and none of it made any commercial sense. We then came up with our own theory which fitted all the known facts and applied it and, quite astonishingly, the whole thing became ABSOLUTELY CRYSTAL CLEAR. By extrapolating that theory, we could then predict what was going to happen, all of which has since come to pass (even though I still believe my crystal ball is a better guide…). That theory is this: this whole scam has almost nothing to do with property. Itâ€™s all about getting far-cheaper-and-easier-than-it-has-ever-been money from the banks (we won’t go into the reasons why now) due to EU membership. The best way of doing this was to SAY you were going to build property, but either doing it wrong, doing it cheaply, or simply not doing it at all! If you could sell it: great, if not: who cares, you’ll never have to account for it anyway! I do not have accurate Building Permit Application figures for the 2001 â€“ 2010 (Nigel?) period but under normal circumstances, this figure should be greatly in excess of the 136,906 constructed dwellings figure for the same period (as not all plans reach constructed dwellings stage). It would be great to compare that BPA figure to the number of development loans granted during the same period (as, in theory, a Property Development Loan should NEVER be paid out without planning permission for the development. We would have to be able to strip out from this figure the renegotiated loans made to hide the Non Performing Loans though, which I suppose would be nigh on impossible). We would then have a more accurate picture of BPAs to Property Developer Loans granted compared to properties actually built. If the theory is correct, then BPAs would be less than PDLs which would be FAR greater than Constructed Dwellings (so borrowed money can be squirrelled away). The government say they only need the EU to bailout the banks due to the loss on Greek bonds. Once the Troika reveal the true state of the banks, it will be clear that a much greater potential loss will be from non performing developer loans, that have been hidden in the books. Developers had never before experienced a recession & kept on building. They thought the downturn was only a temporary blip & life would return to normal quickly. Even when it was obvious that the property market was in a long decline, they kept building. Greed overcame rational thinking. Cyprus is going to go through a very hard time (despite what the government says) after the EU are finished with them.